If all you know about history comes from watching old black-and-white Westerns on Sunday afternoons, you saw that Indian Wars were always Cowboys against Indians. The reality of it, as most history is, is a lot more complicated. The biggest mistake that most people make about Indian Wars is to clump together all Indians, leaving the cowboys on the other side. But it’s so much more complex than that. Indians lived in tribes, and like most tribal people throughout the centuries, had conflicts with the other tribes. This is not to say that all tribal people were constantly at war, but they were always ready to defend their territory, and often needed to. When the "cowboys" showed up on the American frontier, they were moving into areas that looked empty to their eyes, but were filled with people who who knew how to defend their territory. And these warriors had not been fighting cowboys, they had been fighting other Indians. A good example of this was in Arizona in the 1860s. 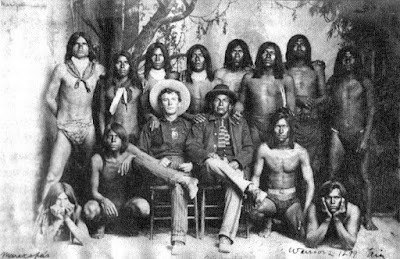 When the cowboys (or more precisely the farmers and soldiers) showed up in The Salt River Valley, where Phoenix is today, they were walking into a ferocious battleground between the Apaches and the Pima/Maricopa people. And so they sided with the Pima/Maricopa people to fight the Apaches. And it became the cowboys and the Indians against the Indians. It's not surprising that over 100 years later, most of this is lost. These types of stories are too complex for Hollywood. And the myth of the west, which was always "cowboys against Indians" is how most people see it, and will continue to see it. And this simple, racist attitude does a disservice to the people who fought these wars, and degrades their memory. Image above: Pima and Maricopa Warriors in 1889, and a cowboy. This was an alliance.